The new Kiesel Vader Series headless basses feature an aggressive, compact beveled body, which provide modern looks with comfortable playing. Generous forearm and belly cuts further add to the satisfying ergonomics of the bass. A sculpted lower cutaway further accentuates the styling of the instrument, while allowing easy access high on the 24-fret, 34" scale fingerboard, and a 30" short-scale option is offered on all three models. Our chambered body option further reduces the already light weight of the instrument. The standard body wood is alder, with an Eastern hard rock maple neck-through design. Dual modulus carbon-fiber rods, along with a 2-way fully adjustable truss rod make the neck remarkably stable, and allows you to adjust the action exactly the way you want it, regardless of your playing style. Other features of the Vader Series basses include a standard Hipshotâ„¢ bridge with exclusive Kiesel locking nut/headpiece assembly, allowing the use of standard bass strings. Radiused-top RADHV humbuckers are standard, with passive electronics and a master volume, master tone and pickup blend controls. Radiused single coil pickups and active electronics are also available. Hundreds of Custom Shop options, including body and neck woods, top woods, fingerboard woods, fretwire, inlays and much more allow you to design your new Vader bass exactly the way you want it. Like all Kiesel and Carvin Guitars, the Vader Series is proudly made in the USA at our southern California facility. Looks like I'm going to have to start saving my pennies up again! Wow...I was expecting this to be for N'AMM...you guys are popping these models out like rabbits! Will split P and 35 1/3" scale be available for this thing in the near future? Pickup Post that may help you! I can't wait to see some of these NBDs, and shots or people holding them (for a sense of proportion). I wonder if there is a reason that the bridge doesn't have the same angled sides that the revised guitar bridge has. Last edited by spudmunkey on Sun Nov 01, 2015 8:39 am, edited 1 time in total. Nice! These will be sweet! 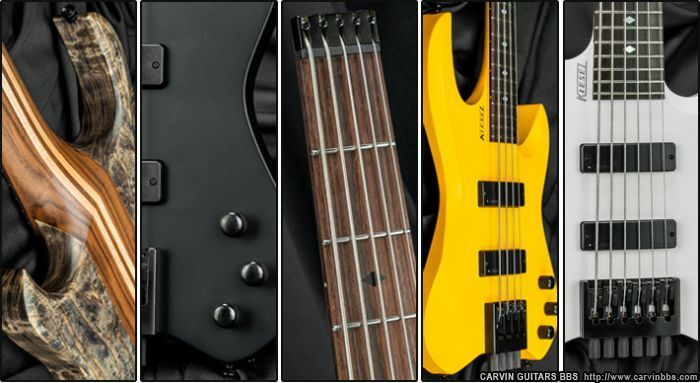 While I appreciate the onslaught of new models, we see yet again another 5-string bass with wide string spacing. Carvin, you listened well to the mob screaming for a headless bass. Please, oh please, give us a bolt-on 5-string with regular string spacing. Thank you. 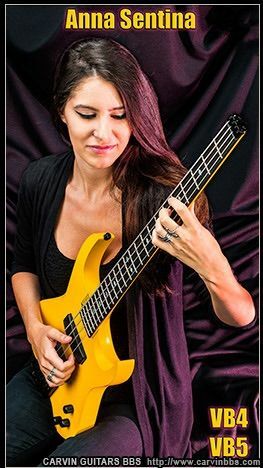 jmfresh wrote: While I appreciate the onslaught of new models, we see yet again another 5-string bass with wide string spacing. Carvin, you listened well to the mob screaming for a headless bass. Please, oh please, give us a bolt-on 5-string with regular string spacing. Thank you. Looking at the builder last night the wide neck was an option. Here's a little video with some info on the new Vader Bass!! I like both pretty equally. I think the Vader guitar has a bit more of an offeset look between the top and bottom halves, which gives more of a raked or "skeletal" look. Something to do with the relatively shallower cutaways or something. I kind of miss that on the bass version. The bass version, to me, sort of recalls the un-rounded LB or otherwise looks very much like a "Carvin" bass. I like it a lot. It's a solid design which should appeal to many. Never saw myself owning a headless, but overall these do look pretty sick, I really like the body shape and contours. The new pickups have me intruiged, too. Any side by side shots of the different scale lengths? MikeBass wrote: Never saw myself owning a headless, but overall these do look pretty sick, I really like the body shape and contours. The new pickups have me intruiged, too. I could be mistaken, but I believe they have not yet shown a shortscale, at all. A bit strange, since this is their first ever shortscale bass. Seems like they should be showing the crap out of one, right away. That and releasing pickups before they have a name? Still some hiccups with product launches. I would also like to see one of these next to an Xccelerator or something. For size comparison. Very nice! I have a soft-spot in my heart for headless basses. Hmmm...what color? While the Vader accommodates conventional strings, can one still use double ball-ends and bypass the clamping system? I like the convenience and have not run across any reference to this feature...or lack thereof. Zooberwerx wrote: Very nice! I have a soft-spot in my heart for headless basses. Hmmm...what color? OK, pulled the trigger, can't wait to get my Vader V6!